Layers of baked pasta, crunchy edges of melted cheese, flavorful tomato sauce, and fragrant Italian seasonings. 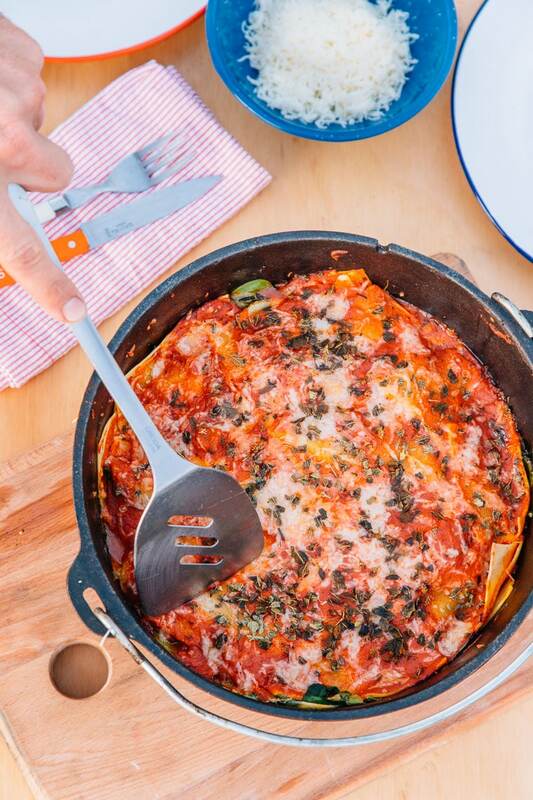 Can anything come close to the mouthwatering perfection that is lasagna? We doubt it. 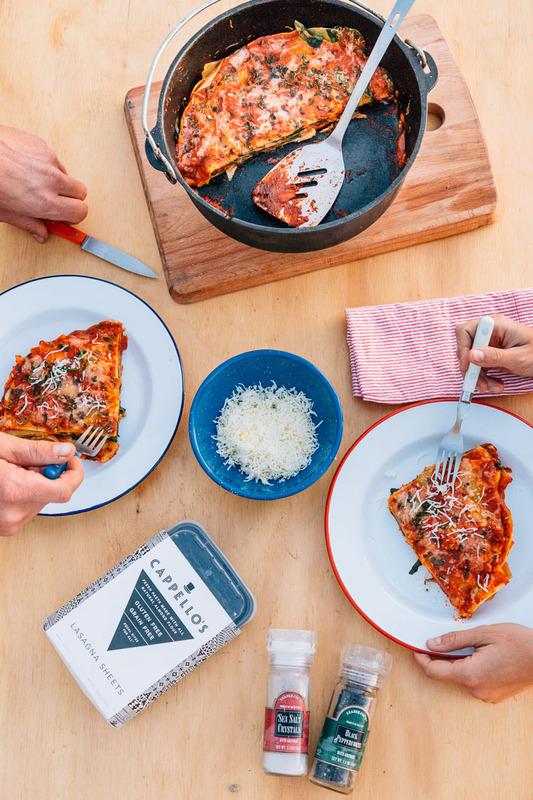 Some foods satisfy our stomachs, some foods spark our intellect, but lasagna speaks directly to our hearts. It’s like a big loving hug from the Italian grandmother neither one of us ever had. But you say, making lasagna is hard enough at home, and you’re talking about making it camping? That doesn’t sound like…possible. To be honest, we didn’t think it was either! We thought the closest we’d get to eating lasagna in the wild would be in the form of a freeze-dried backpacking meal. Which is just a tactless parody, if you ask us. 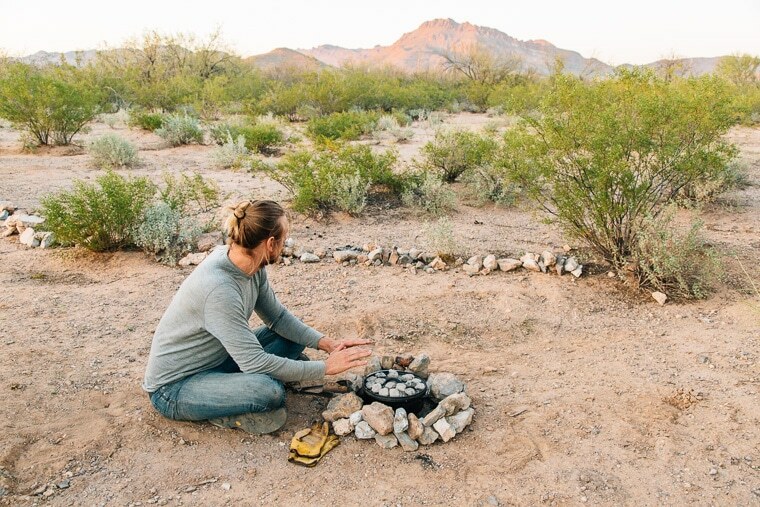 Now, there are two things required in order to make campfire lasagna: a camping Dutch oven and fresh pasta. 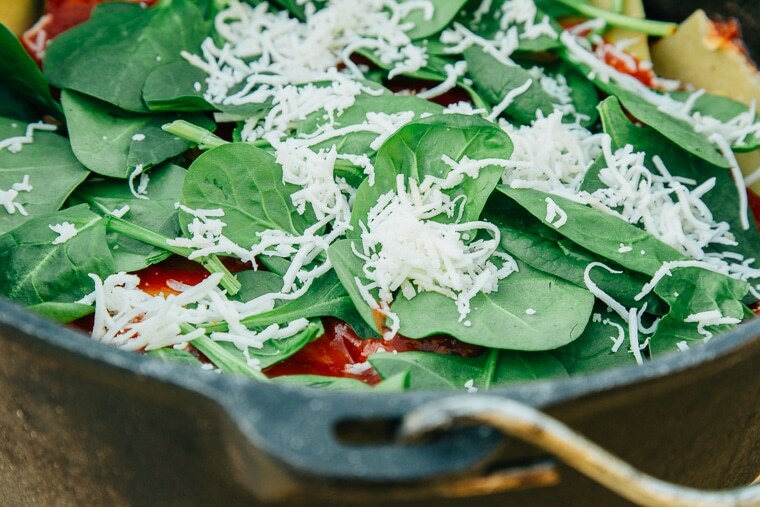 We’ve cooked a lot of camp meals in our cast iron Dutch oven, but this one has to to be our favorite. The bottom legs allow for coals to be pushed underneath while the rimmed lid allows for more coals to be piled on top. With the even heat coming from both directions, you’re able to get the inside up to temperature so you can bake away. The other critical element is fresh pasta. The biggest hassle of making lasagna from dried pasta is the need to boil all of it first, then bake it. We know there are a few dried lasagna pasta makers out there who claim you don’t need to boil the noodles first, but those people are liars. (Trader Joe’s we’re looking at you.) The easiest way to get delicious, toothsome lasagna without any undercooked surprises is to use pre-made fresh pasta. 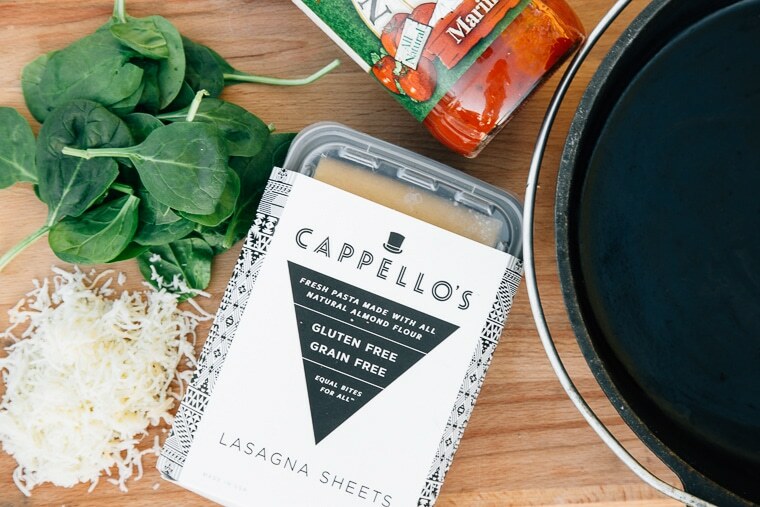 For this recipe, we used Cappello’s lasagna noodles (found in the freezer aisle of Whole Foods), which in addition to being ready-to-bake, are also gluten-free. While neither of us has a problem with gluten, Michael’s mother has celiac, so we’re very aware of the need for gluten-free options. However, we were concerned that pasta made primarily out of almond flour wouldn’t fit the traditional flavor profile we were going for, but you have to believe us, it tasted exactly like wheat pasta. If this pasta was served to us blind, we would have never guessed it was gluten-free. And since it’s frozen fresh, once it thawed it was soft, malleable, and ready to start baking as soon as we opened the package. 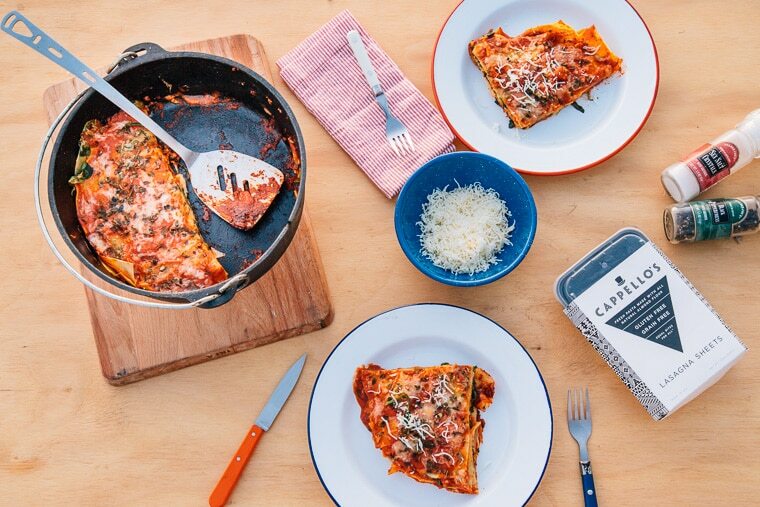 So there you go, a cast iron Dutch oven and fresh pasta are the only things standing between you making lasagna the next time you’re out camping. So what are you waiting for! Get cooking! PRE-HEAT: If cooking over a campfire, get your coals ready. You'll need 25 total. If cooking at home, preheat your oven to 400. ASSEMBLE THE LASAGNA: Start by coating the bottom of a 10" Dutch oven with the olive oil to help prevent the bottom layer from sticking. Add 1/2 cup pasta sauce and spread evenly over the bottom of the Dutch oven. Use the first set of noodles to create the base of the lasagna. Layer 1/2 cup sauce, 1 cup baby spinach, and 1/3 cup cheese. Repeat (one set noodles, 1/2 cup sauce, 1 cup spinach, 1/3 cup cheese) two more times. For the final layer, use the last set of noodles, 1/2 cup sauce, and 1/2 cup cheese. Sprinkle the oregano over the top. 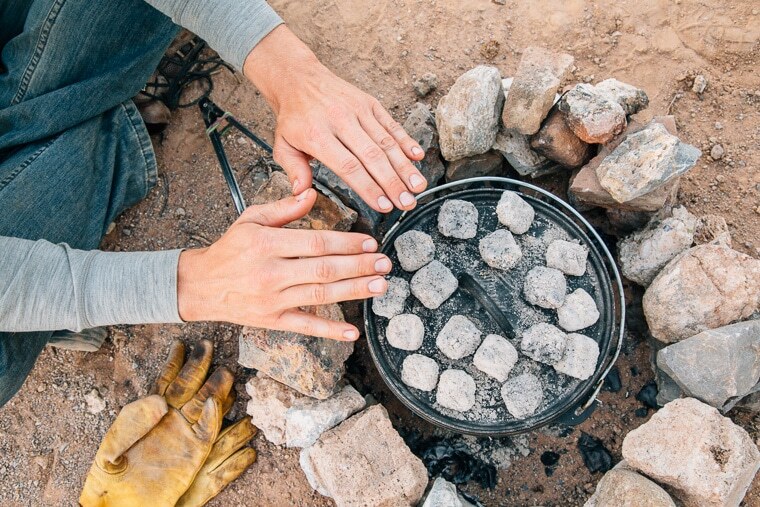 BAKE: Use 8 coals to create a bed to set your Dutch oven on. Place the Dutch oven on top of the coals. Cover the oven with the lid, and place the remaining 17 coals on top of the lid. If cooking at home, simply cover your Dutch oven and stick it in your preheated oven. Bake for 30 minutes, until the noodles are tender and cooked through and the cheese has melted. SERVE: Take the Dutch oven off the heat. Carefully remove the lid and set aside. Cut the lasagna into 4 wedges, plate, and enjoy! 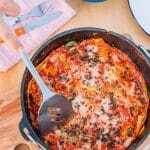 This is a super dooper recipe – I’ve used it several times with and without a dutch oven. Ok I don’t really like buying meat sauce so I make my own but apart from that I stick to the recipe and using spinach just gives that extra moisture to it – and makes the white or cheese sauce completely unnecessary. Really great taste and texture. Thank you. This looks good but I don’t understand why this is labeled lasagna without ricotta or cottage cheese. We don’t happen to like the cottage cheese filling and only use ricotta but that is a personal taste thing. Not trying to be negative or anything just curious. Hey Brianna! Since ricotta is one of those cheeses that can spoil easily we adapted this recipe to use a heartier cheese that could withstand a few days in a cooler at the campsite. If you’re on a shorter camping trip or cooking this at home, it would definitely work with ricotta! I love the recipe, best lasagna I ever made! I added some lentils though, it gave a nice bite and improves nutritional value. Now off to try some more of your Dutch oven recipe! I have made this several times while camping. It is fantastic and easy! We add different substitutions sometimes, like fresh basil or zucchini. It has always turned out fantastic! Thank you so much for sharing. We cook a lot of Dutch oven recipes however we usually use parchment paper to line the Dutch oven. Do you recommend that for this lasagna recipe? We haven’t tried it with the lasagna recipe before, but we don’t see why it wouldn’t work. Is it possible to use the dutch oven on a camp stove? Yes, but in order to get top-down heat, you’ll need to put coals on top of the lid. Otherwise, you’ll get an overcooked bottom and an undercooked top. can i change the spinach into meat? Absolutely! In that case, I’d recommend browning the meat a bit in a pre-heated dutch oven. 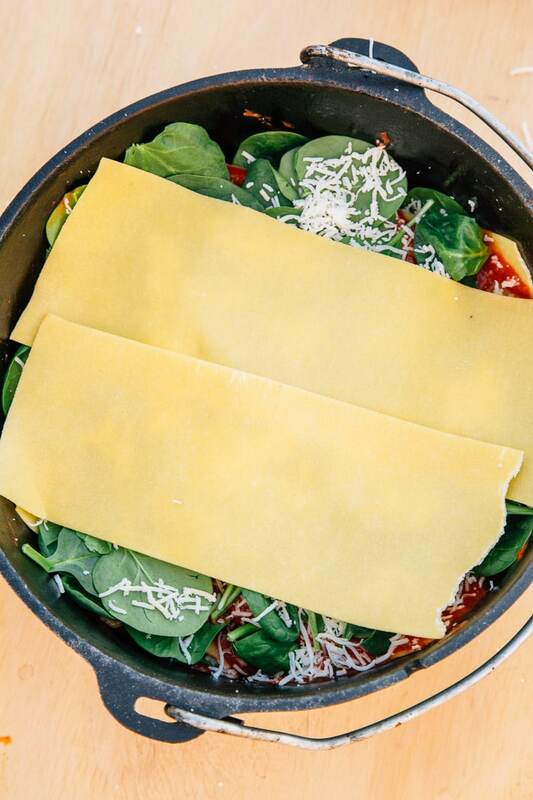 Then take it out, build the lasagna, substituting the spinach layer with the meat, and bake! I’m a farm wife in Alberta, Canada & was trolling thru Pinterest for something easy and fast to feed my hubby & father in law in the field. AMAZING!! I used all the ingredients along with a small red & fellow pepper I roasted on the grill first, cut up and added to the layers. (We like it a little spicier! ????) They loved it!! Thanks so much for all your experiments with awesome recipes! Keep it up, please! Thanks, Gina! Glad they enjoyed it! Good one. it is a very interesting blog. Thanks for sharing this article. Thank you so much for your site! We recently camped for a week around Vancouver Island, BC with our 3 year and dined solely on your recipes. Everything was amazing and my favorite was this lasagna dish. Thank you very much for your efforts and we look forward to many more camping trips with your recipes and tips! Tried this recipe. Wasn’t even enough for three people! Need to use double the sauce. Tasted great! Just wasn’t enough. 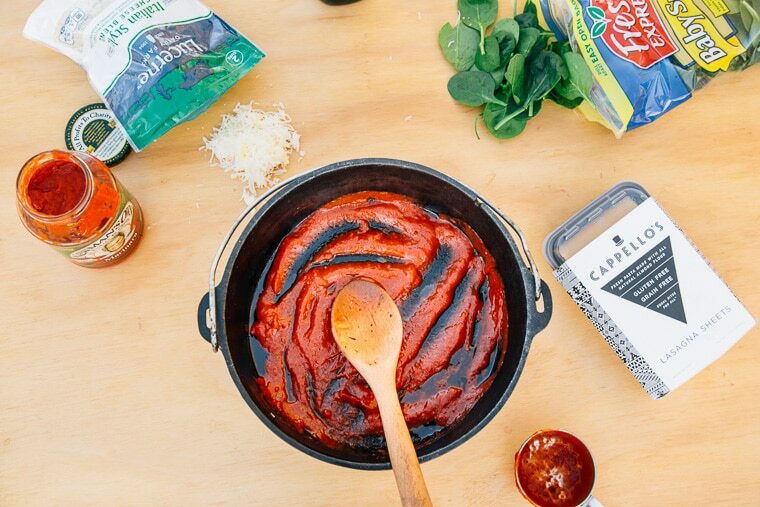 Yum…this makes lasagna seem like so much less of an “event” to make, but just as satisfying! We are all about the looks-and-tastes-impressive but easy to make camping meals around here! Beautiful photos! This dish looks so delicious! Plus everything made outdoors in a Dutch oven just tastes better too!